Our Overall Rating: 4.5 / Best known for: Named for Howard Marks, smuggler. Balanced bud. Origin / ancestry MR. NICE GUY: type, hybrid. Parents: G13 pot, Hash Plant weed. NICE GUY is named for possibly the largest and most notorious pot smuggler in history. Oxford Alum Howard Marks wrote an autobiography about his daring adventures, called Mr. Nice Guy. It became the inspiration for this cross of the infamous, high yielding G13 and Hash Plant. Mr. Nice Guy was created by Sensi Seeds. 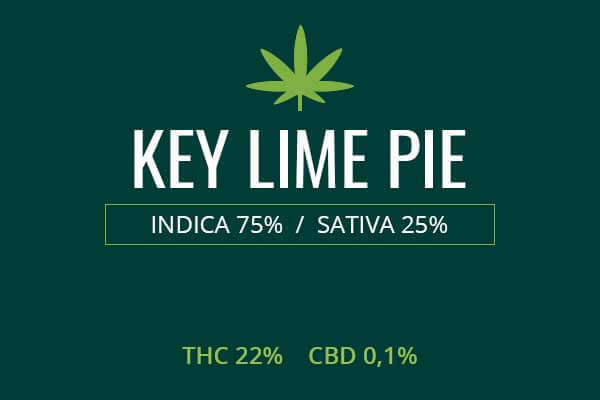 This Indica hybrid produces a very smooth and clean smoke that is gentle and slow-moving. It will creep up on you slowly, enveloping you in warmth and good cheer, without too much stimulation or too much relaxation. NICE GUY may have a frosty appearance as it is packed with white trichomes and strong resins. Long orange pistils peer through the frosty layer, to a green backdrop of the resin-packed leaves, buds, and flowers. A nugget of Mr. Nice Guy is likely to be dense and sticky. It will smell earthy and piney. The smell is strong enough to fill a room but not unpleasant. It instantly lifts your mood and makes your taste buds water. Mr. Nice Guy has a sweet, pine, and spicy flavor. These flavors come together perfectly. The pine balances out an earthiness, and the spiciness is the palate cleanser. This interplay of flavors potently activates the hunger drive and the munchies ensue. Growing weed from MR. NICE GUY cannabis seeds and cuttings is of medium difficulty. It requires a warm climate with plenty of sun. Flower Power fertilizer is an excellent choice to provide extra nutrients. Mr. Nice Guy will require some staking and trimming, so some gardening skills and experience will be needed. Indoors, you can expect a flowering time of 9 to 11 weeks. 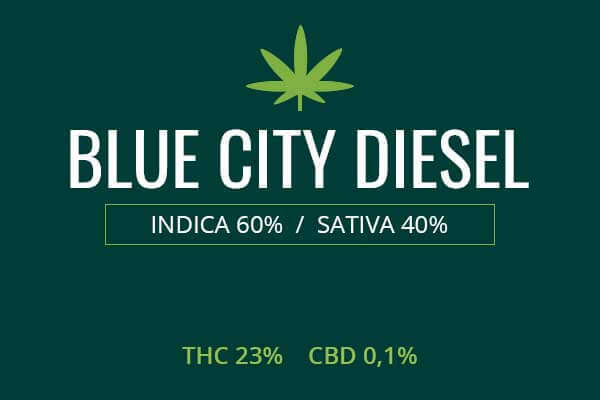 A harvest of about 14 ounces per square meter of this gentle bud will be your boon. Outdoors you will be waiting till late October for a harvest. Outdoors yield will be around 16 ounces for each plant of sweet and spicy, gentle bud. 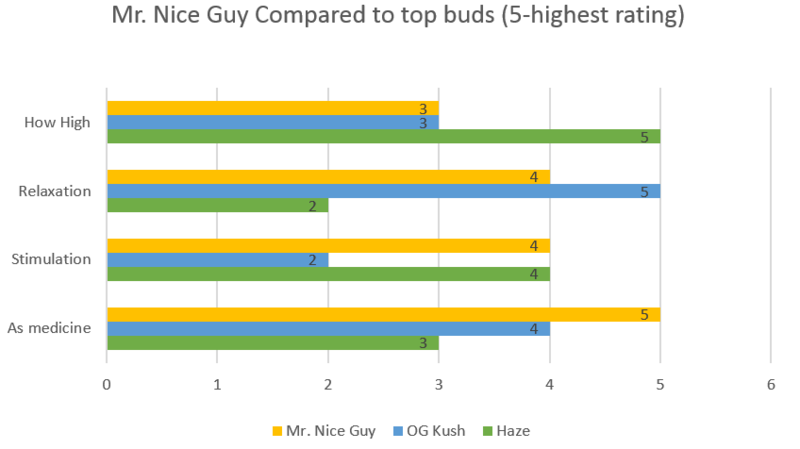 NICE GUY weed has low-medium THC levels, from 13% to 19%. It is highly medicinal due to its Indica properties. 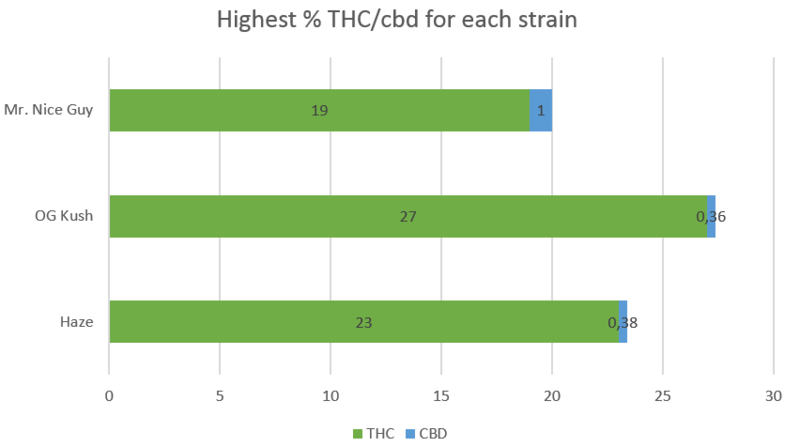 Because THC levels are sufficient but not overwhelming, patients can get more medical benefit over longer periods of time from this strain without experiencing the side effects associated with overdose. This strain can therefore be used for chronic stress and chronic pain over more extended periods of time than similar strains. NICE GUY used for chronic pain can be dosed much easier than strains with higher THC levels. It comes on slowly and it’s easier to pace yourself. You can truly have just enough to relax and treat pain, without too many recreational effects and without overdose. For chronic back pain, this can be a life-saver. Many people with chronic back pain are not particularly interested in recreational effects and would like to limit those effects. 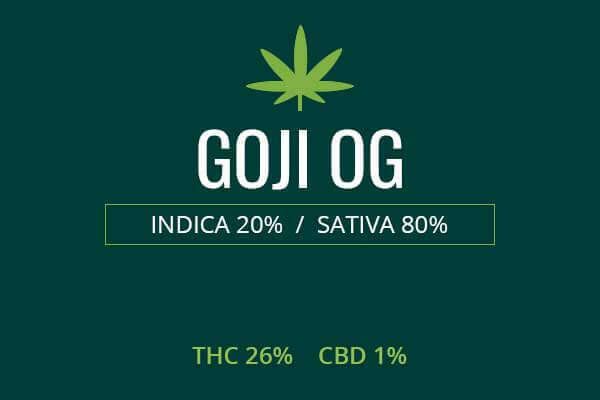 This is a good strain to use for that purpose. NICE GUY’s relaxation effects can be used to treat chronic stress. You may experience symptoms like muscle cramps and unexplained stomach uneasiness or nausea. These may be signs of stress which can be treated with this strain. NICE GUY Comfortably reduces nausea of many causes. It can also boost mood and is useful in anxiety, depression, and insomnia. The hit of MR. NICE GUY is sure to creep up on you slowly and melt away stress. It will slow you down but won’t stick you to the couch. You will feel relaxed but light on your feet. 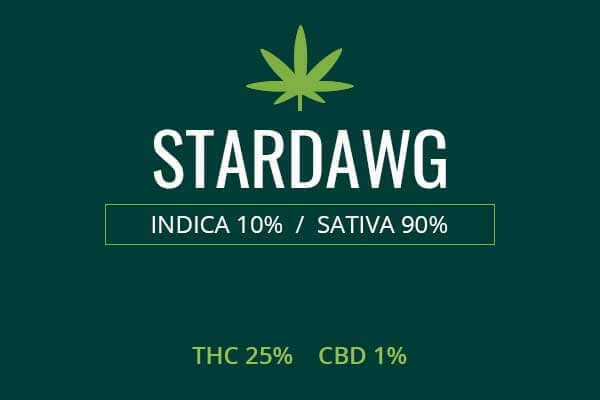 Some people will indulge in larger quantities of this strain because it’s so smooth and the effects are incredibly pleasant but easier to handle. 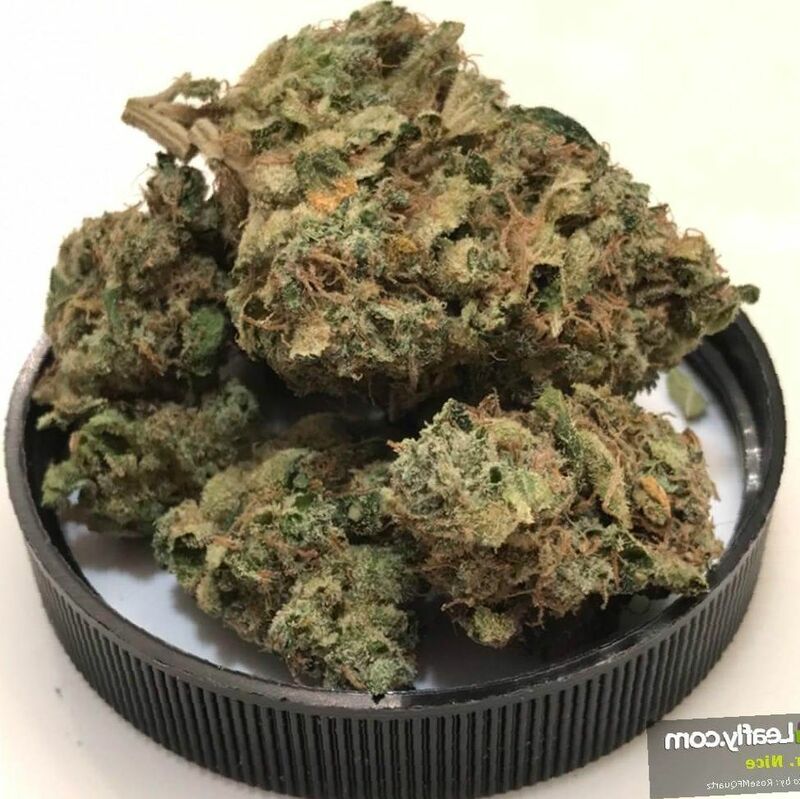 If one chooses to use this strain over an extended period of time, the hypnotic effects become more pronounced and you should be ready to retire for the night or take a nap. Mr. Nice Guy was also the strain sold in the stoner-comedy, Half-Baked. As depicted in the movie, Mr. Nice Guy may equip you for creative pursuits, but you will want to keep lots of food close by because it will give you the munchies. 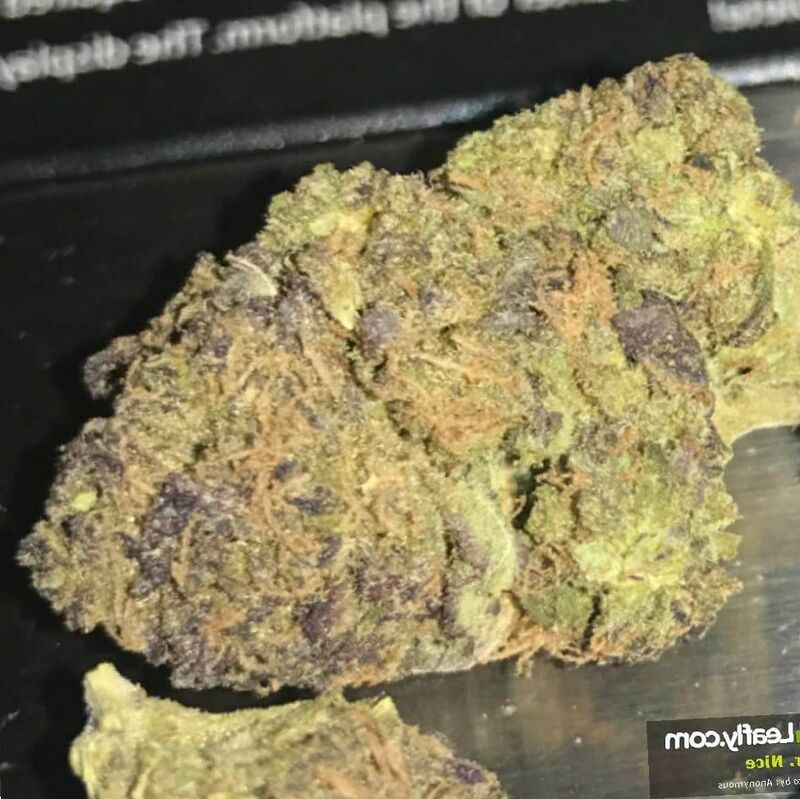 I cannot say that this is the best indica I’ve tried but definitely a good one with a high THC level. I tried it for muscle pain and it helped me to relax. No couch locking but not for daytime because Mr. Nice Guy makes you sooo lazy you don’t want to do anything! Will probably recommend it as a good sleep pot. Bubba Kush is typically the strain of my choice but after trying Mr. Nice Guy I feel like I should make it my before-going-to-bed marijuana. 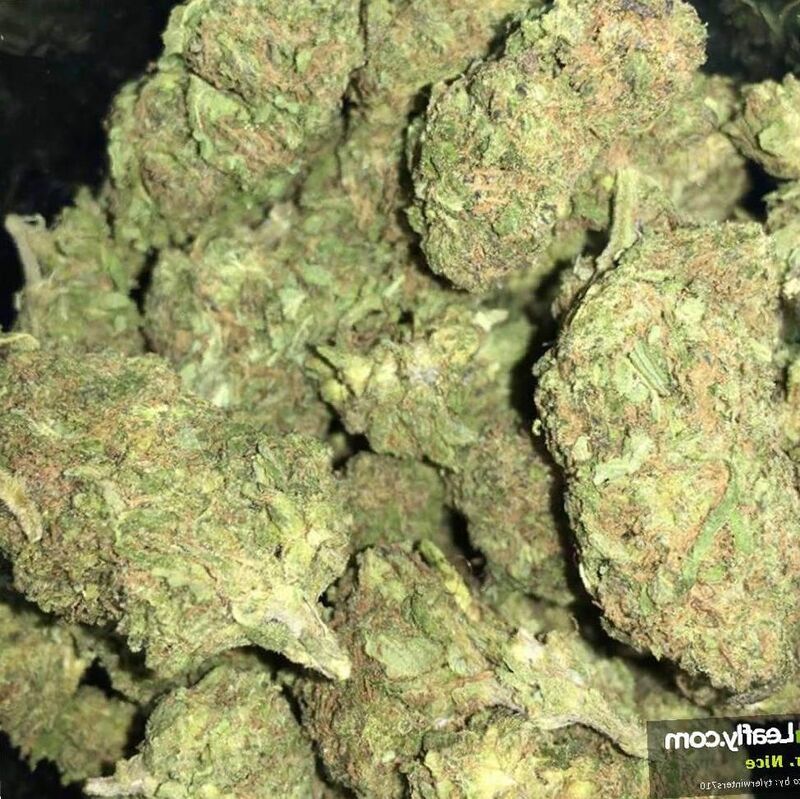 Perfect indica, with superb relaxing effects that make you feel like your body doesn’t exist. And I was surprised how good it was for me as a high-tolerance user because it hit me immediately. So I bought myself some Mr. Nice Guy and was getting ready to have a good nap. I suffer from insomnia and the effects of medications have been a bit uncomfortable for me recently, so I turned to marijuana. Just 5 grams of this stuff got me feeling very light and very fuzzy-minded. It was extremely hard to concentrate, which I didn’t like but soon I got super relaxed and cozy. After a couple of hours, the effects began to wear off. The sleep I had afterward was unbelievable. Mr. Nice has been my go-to strain with my medical issues. Earlier, I managed my anxiety with an anti-depressant, but now it seems that marijuana makes much more sense to me because it produces a rising euphoria that felt great. I didn’t experience any side effects but ended up having perhaps the best two hours of my life! In fact, I was so relaxed and uplifted it seemed that I finally turned off my anxious brain! Bravo Mr. Nice Guy!!! It was a couple of days ago when this assistant at the local dispensary advised me to try those buds covered in trichomes. I thought they looked great and smelled great, but how about smoking? So I bought some, and it was a good purchase because it was an incredible smoke, too! I’m retired but I think if I smoked Mr. Nice Guy and went to work, I would manage to accomplish everything while having a good time... Seems to me like a great work strain… Going to visit that dispensary once more this week to get more of Mr. Nice! This is definitely a good strain for relieving the symptoms of hypertension. I’ve been diagnosed with hypertension several months ago, and it was a real shock considering I’m just 46-year-old. Anyway, I mainly use diuretics to battle the symptoms, but recently I’ve been discovering the benefits of pot for reducing the stress. When I smoked Mr. Nice Guy marijuana for the first time, I thought it was very relaxing, took my pain and stress away pretty quickly. Looking forward to discovering more!